If you’ve been reading this blog for a while you know that I am a proponent of using video in email. In the past I have written about how non-profits can use video in email to increase donations and how you can greatly increase your click through rates by including video in your email marketing strategy. I’m a bit of a tech geek so its always been easy for me, create a thumbnail image that “looks” like a video will play and link to the video on a landing page. A simple formula. However having the right tools to edit that thumbnail image has always been a bit of a hurdle for the less technically savvy to get videos integrated into their email design. Thankfully Constant Contact has come up with a very simple and intuitive solution to solve this problem. They have added a feature so you can very easily add a video link that will automatically generate and insert a video player thumbnail image into an email template. To begin, open an email layout. I recommend you select a block near the top of your email, if the video player appears within their email preview window, they’ll be more likely to open the email or click the link directly within the email window. 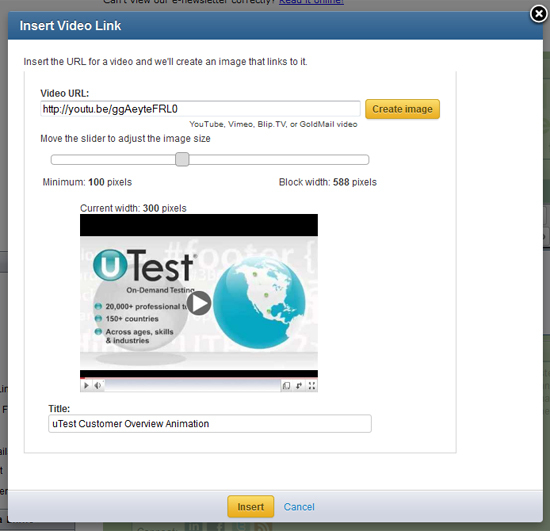 Within a block on the email, place your cursor where you want the video image link to appear. 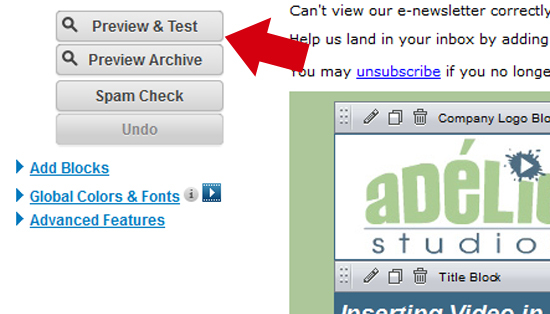 Then click “Video Link” button that is under the insert menu on the left side (see below). When the new window opens all you have to do is copy and paste the URL link for a specific video on YouTube, Vimeo, Goldmail or Blip.TV. Then click the “Create Image” button. This will automatically pull the thumbnail image for the video you selected into your email template. If you need it larger or smaller you can utilize the slider function to resize the image so it visually fits the block within your email template as you’d like it to appear. You can also optionally change the title if you are segmenting your list and you want the video’s title to be geared specifically to the audience’s needs. Leave the “Title” field blank if you want the video to show without a title or text underneath. Click insert and the video will appear within the block. Save the block and, as always, don’t forget to save and test the email by going to preview, you want to make sure that the video will actually link correctly to any links you include (not just a video). This feature makes it incredibly easy for pretty much anyone to add videos to their email. If I had to say one thing I don’t love about this feature is that it’s limited to integration with YouTube, Vimeo, Goldmail or Blip.TV. I know, I know most people have their videos on YouTube. But if you had the choice between driving the viewer of your email to your website or to YouTube, which would you prefer? On your website you can guide the viewer easily toward what you want their next action to be rather than on YouTube; the giant candy store of visual distractions. 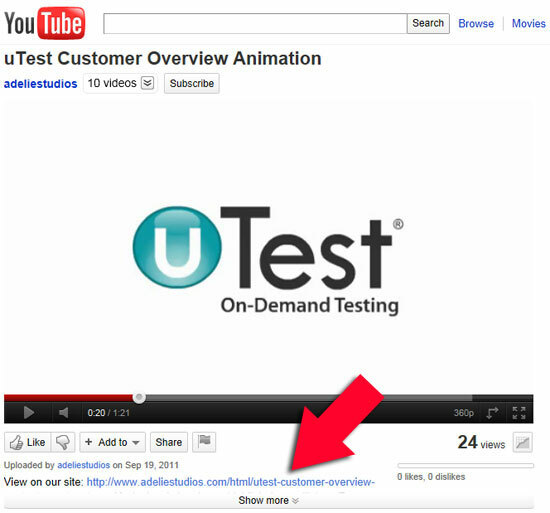 One way to get the viewer to take the next step over to your website is to include a link at the very top of the video description on YouTube (see below). There you could include a call to action to watch the video with additional features, download a free related ebook, etc. Then once they have clicked over to your website, you have them in your playground and you’re holding the ball. My nit-picky comment aside, this is a very cool upgrade by Constant Contact. Ideally you want to drive traffic to your website not YouTube, Vimeo, Goldmail or Blip.TV. The bottom line though is if you keep viewers interacting with you content, no matter where it is – it’s a good thing. Kudos to them for developing this to make it simple for their general user to integrate videos into their email marketing. They’ve also developed a short screencast video showing how to use the new feature. Have you used this to integrate video into your email marketing yet? Thanks for writing about video email. It’s a concept whose time has come (actually came years ago). At BombBomb, we’ve built an email marketing platform that was designed to support video since day one. We’d love to have you give it a look and a free trial, then share your experience. Thanks again for spreading the word about video email! Ethan – Glad you enjoyed the post! I will definitely take a look at BombBomb and write a review once I’ve had a chance to play around with it. Super – would love your feedback. Also: the style of your animations is fantastic! We have a very robust video marketing platform that does not push your web traffic to YouTube…. ComF5 has been embedding video into email since 1999. If yo visit my site, http://www.omarhenderson.ws you’ll see this and its many other tools and features. It’s a leader in the industry as far as it’s available tools.